You're sitting on a pile of about a million telescopic photos of the universe, and each one needs to be classified. Bit of a job. So what do you do? Astronomers at the University of Portsmouth, Oxford University, and Johns Hopkins University came up with a solution last week that not only alleviated the burden but also generated an enthusiastic response from the public: They opened up the project to volunteers via the Internet. The goal of the project is to identify and classify galaxies all over the universe and create a distribution map of galactic types--primarily spiral versus elliptical, but with some variations as well. In order to accomplish this, the three universities opened up the project on a website called GalaxyZoo (link below). 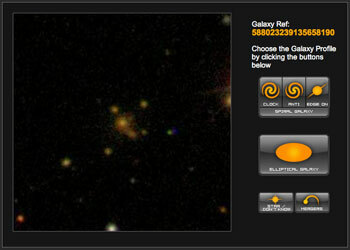 Users log into the site, then are shown images of galaxies (and other cosmic entities). They then enter information about they images they see. As seen in the image above, there are five pieces of information users can enter about a galaxy: spiral clockwise, spiral counterclockwise, spiral edge-on, elliptical, and merger. There's also a button for "star/don't know," in the event that an image is indecipherable or contains a non-galactic object, such as a star, satellite, Great Old One, etc. Images come from a 142 megapixel camera mounted on a 8.2-foot telescope in New Mexico used in the Sloan Digital Sky Survey. "It is great that digital archives we have built for science are now being used by the public to look at the Universe. It's fundamental to our understanding," said Bob Nichol, University of Portsmouth Institute of Cosmology and Gravitation. In order to minimize inaccuracies in data entered by volunteers, the universities have set up three mechanisms on GalaxyZoo. First, prospective volunteers are led through a tutorial on identifying basic characteristics of galaxies. They then take a test to ensure they meet minimal requirements (which, in this case, is correctly classifying at least eight out of 15 known galaxies). 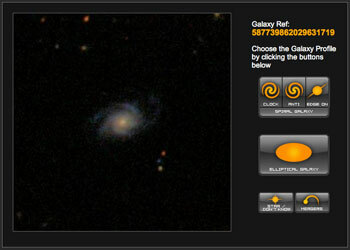 Once the test is passed, users can begin classifying galaxies. Some can be straightforward and obvious, like the clockwise-rotating spiral galaxy in the image below. Others can be quite fuzzy or pixelated and difficult to classify. Some may also show multiple galaxies centered in the image that may at first appear to be merging galaxies but that may simply be tightly packed clusters of galaxies. So there's a third measure to help minimize inaccuracies: Data entered by volunteers is cross-checked with data entered by other volunteers. If there's disagreement about a particular galaxy, the image is flagged for further review. "The scientists hope that with the public's help they will shed light on how the different kinds of galaxies are distributed across the sky," said a statement released by Portsmouth Wednesday. "The results might even reveal that there is something fundamentally wrong with the existing models of the universe."